Let me be blunt about this first: The new regional president, Mustafe M Omar, was appointed in not too dissimilar fashion to his predecessors and only time will tell whether his tenure will also be accentuated by parochialism and subservience to ruling dominant group. I accept that it couldn’t have been any other way and anyone trying to hold that against the new president is severely misguided because blame should be sought elsewhere – starting with deep self-reflection. In the meantime, we welcome the new president’s imposition to the extent that we welcomed the former president’s deposition; by means of force and by way of direct rule as is befitting to any colonised peoples. I make these points not as afterthoughts or simple exercise of qualifying ensuing statements, but in order to reorient our focus towards the big picture as to escape events that may be clouding our judgement. I, for one, am grateful for the valuable insights we’ve garnered from the ease with which the constitution was contravened to mobilise the Ethiopian National Defence Force (EDNF) and the heightened operational alertness reserved only, it seems, for Somali political affairs as inferenced by the military holding station for months amid ongoing deadly clashes and ethnic cleansing. 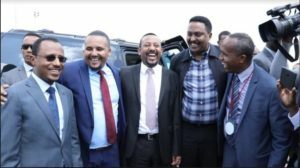 Therefore in the spirit of hoping for the best and preparing for the worst, we have to engage our critical faculties to examine the overarching strategic directives implied by this intervention, if any, both within and without Ethiopia. Since we cannot exhaustively consider all aspects of decade-long silent socio-economic engineering, which also indirectly heralded current political transformation, I’ll highlight one central feature for detailed examination limited to few easily demonstrable examples sufficing us to draw the necessary conclusions. For those who haven’t realised yet, a central clog in the machinery most efficiently marginalising Somalis is the systematic thread running through sequencing institutional choices and multilateral policies, each producing stronger feedback mechanisms reinforcing preceding decision making scenarios with multiple causational relationship loops. Thus when United Nations, DfID, USAID and the likes become more vested in the political project of Ethiopia, they routinely become part and parcel of state tools made available at the disposal of Ethiopian People’s Revolutionary Defence Force (EPRDF) which in turn has a knock-on effects on many other programmes further facilitating exploitation by repressive authorities. In other words, aid and development sectors are not only highly political, it’s so effectively by design and with the full consent of Ethiopia’s international partners who guarantee the inherent structural biases. For avoidance of doubt, ‘highly political’ and ‘by design’ is not just referring to institutions like the United Nations Industrial Development Organization (UNIDO) whose crass political agenda was too obviously exposed by its participation in rubberstamping resource mobilisation of nearly $1billion for 4 integrated agro-industrial parks (IAIP) in 4 different locations, which somehow “coincidentally” correspond to the exact same 4 constituents of EPRDF parties; namely Amhara, Tigray, Oromia and SNNP. Instead, we should focus on sophisticated actors, such as the World Bank, responsible for deep-seated subtle magnifiers of marginalisation with multiple economic dimensions. consider this; World Bank increased its commitment funding by $977million within a month of Abiy Ahmed becoming PM, which in comparison was more than its commitment funding for the whole of 2017 ($953million). Total World Bank commitments for 2018, including the additional $1billion budget help announced only few days ago, so far stands at a staggering $4.2billion – that is the highest ever single year funding commitment in the bank’s history for Ethiopia. These figures may appear neutral or even positive, that is, until you analyse the locations and types of projects supported. World Bank programme funding in Ethiopia was $14.2billion since 2008 and involved 648 project locations, out of which only 7 (or just 1%) were located in the Somali region. So there’re two insidious consequences here; first one is the direct cost associated with missing out on projects that were badly needed by local Somali communities and; second, indirect impact which arguably had a far bigger ramifications. As the former impact is straightforward, let’s limit ourselves to examples highlighting the latter in order to fully appreciate the magnitude and sheer brutality of the forces responsible for conspiring circumstances Somalis are grappling with. One of the main indirect negative consequence of World Bank funding is that it intentionally creates clusters of projects which disproportionally favour certain regions over others, for political reasons. So as chosen areas get more road networks, better electricity and other logistics-critical infrastructure, these locations subsequently become more attractive for investments at the expense of peripheral regions.